I am going to show you how to find the key when you have just a written piece of music in standard notation and also when you just know the chord progression. To find the key when you see a piece of music in standard notation, you must look at the key signature. The key signature is located at the beginning of the line (for more info on the key signature refer to my lesson on Reading Notation and Tablature). This is where sharps and flats in standard notation are placed. Their are either sharps, flats, or neither in the key signature. Sharps and flats are never mixed together. You can determine the key by counting the number of sharps or flats in the key signature as long as the key signature does not have 5 sharps or flats. You must use a more complicated process to determine the key if this occurs. Here is a chart to show you the key if you have 4 or less flats or sharps in the key signature. When there are no sharps or flats, it is the key of C.
Now, to find out which notes are sharp or flat, we will use the circle of fifths. If you can remember that the 1st sharp is F# and the 1st flat is Bb, then you will have no problem finding the sharps or flats in a key signature. Figure 3 will show you how to find the sharps or flats in a key signature. To determine the flats, you must find Bb on the circle of fifths. Bb is the 1st flat. Now go counterclockwise 1 place. You land on Eb. This is the 2nd flat. Continue this process of going counterclockwise to get the 3rd, 4th, and 5th flat. There are only 5 flats because if you continue this process to find the 6th flat, you will find B, which is not a flat. Now comes the hard part… finding the key when there are 5 sharps or flats. When there are 5 sharps or flats, it gets tricky because there are 3 keys that use 5 sharps or flats. These keys are B, F#/Gb, and C#/Db. All 3 of these keys have the same 5 sharps or flats. The difference between these keys is the notes that are not sharp or flat. In the key of B, those notes are B and E. In the key of F#/Gb, those notes are B and F. In the key of C#/Db, those notes are F and C. You must know these notes so that you can determine the exact key because the only way to determine the key now is to find those 2 notes used in the song. For example, if you see a B being used, you have eliminated C#/Db from being the key. Then you must seek find either an E or an F to differentiate between the key of B and the key of F#/Gb. Look at each scale and see if the chords’ root notes are within that scale. If they are, that is the key you are in. Hello if the song has E minor, C and D chords what is the Key? The key is E minor. Two major chords in a row indicate the 4th and 5th degree of a major key (G major in this case) or the 6th and 7th degree of a minor key (E minor in this case). Since you have an E minor chord and not a G major chord, the key is E minor. Note: E minor is the relative minor of G major, which means they use the same notes and have the same key signature (one sharp – F#). I hope this helps. Hello. My song has Am, E, Dm in the verse, but later makes use of Em, C and G as well. I think the key would be Am – is this correct? You can tell right away that this song either changes keys or simply plays a chord outside of the key. I can tell because you can have 3 major chords, but two are a step apart. This does not follow this pattern. Having an E major and E minor chord is another clue. With that said, the song might change keys in the middle. The closest key is A minor. I hope this helps. Hello Tony, This song does not fully adhere to a key since it has four different major chords. However, it is very close to the key of G. The F# major chord will produce two notes that are out of key: A# and C#. 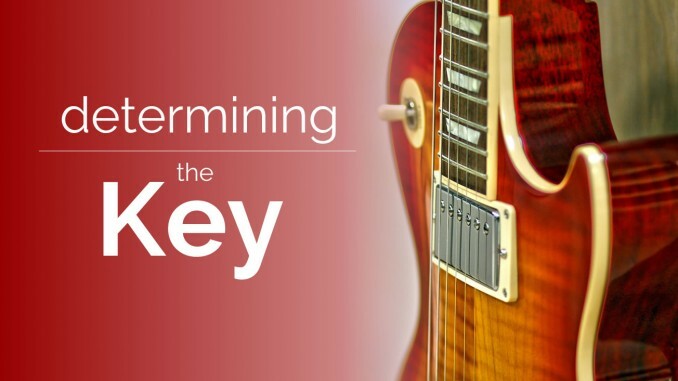 If you want to bring that chord into the key, you’d play a diminished chord. I hope this helps. My song has B, Am, Em, D and F#m. What key is it in? Those chords do not match a major or minor key. It is likely that the song changes key or simply plays out of key from time to time. I see from the other comments that one person is doing all the work, so i figured, i might as well follow suite. The verse is Am F C G. The chorus is Em C G D. I am pretty sure if my friend solo’d over the verse he’d be wanting to play in Am as the F C G are rather rapid and the main part sticks to the Am. However if i’m wrong, i’d like to know. Thanks! You are correct on using A minor over the verse. The chorus changes the key to E minor, so you probably want to use Em over it since Am would clash over the D major in the chorus. If the verse is in A minor, could he use the Am pentatonic scale? Tom, I am sorry for the late reply. They appear to be changing keys. The first progression line is the key of G. The last progression line is the key of D. The bridge literally bridges the two keys. Notice how the first progression ends on D and the last progression starts on D. Now, notice that the bridge starts and ends in A#. Looking at those notes, they are (mostly) a half step from each other. Chromatics were used to shift the key smoothly. Also, Am7 sounds like C major because it has a C chord in it. C major has the notes C-E-G. Am7 has the notes A-C-E-G. This is a trick for all minor 7 chords. Hello, Patrick! This is a very well-written lesson, and it has helped me a lot in the past! However, I have recently written a piano piece that utilizes G, C, D, and Em chords throughout. I know that it is either in the key of G major or E minor, but I’m not sure how to determine which one. Do you have any advice? Hello Katie. Given that you are playing the major chords G C D with Em as well, it probably sounds like the key of G. If it were E minor, I would expect to see Em Am and Bm or something similar in the song. Here’s how I looked at this case: Take the tonic chord (G vs Em) then look for its IV and V chords (C D or Am Bm). That can usually tell you if it’s the major or the minor key. Since you have the major chords and not the minor chords, I think it’s G major. I hope this helps. My song chord are D A Emin D A G.so which one is the key signature for this chords.I guess it is D.Am I right? You are right. This is the key of D.
Playing progression with slow tempo in 4/4: G Cmin Emin D. That Cmin to Emin seems unusual and has a nice feel. We can’t figure out what key this progression is in. We tend to just play each Chord’s scale. Any ideas? It is most likely the key of D since C is minor in the key of D. In the key of G, C is major. Thanks for the lesson, I love it! I’m still learning a bit. I want to use the song of “3AM” by Matchbox 20 as an example here. The main progression is a Gmajor, Cadd9, & D. I know it’s not in the key of D because “C” doesn’t exist in that scale. However, G, C, & D exist in both the G major & minor scale as well as the C major & minor scale. How do I find the key? Can I use a pentatonic scale to further investigate? I know G major pentatonic has G, C, & D but the C major pentatonic does not but I don’t know if that’s relevant since the pentatonic scales are just major scales with the the 4th & 7th removed? In pop music it’s common to run into some form of this progression so it would be helpful. Thanks! That chord progression is in the key of G because all three are major chords and C and D are major chord a major second apart from one-another (indicating that they’re the IV and V chords). Also, I wouldn’t use pentatonic scales to figure out a key because they remove notes so they can be played over more chords. I hope this helps. Please can you advise what key I’d be playing in if I was playing Am, Em, C and G with a capo on 3rd fret? Thank you. It could be either the key of C or the key of G. Since you have a capo on the 3rd fret, it is likely the key of G since the 3rd fret has G on the 1st and 6th string. If I play G-Gaug-Em is the key G or Em? Also, someone told me that since it resolves to Em that would actually make the second chord B aug since B is the dominant of E. Is that accurate and if yes could you please help me understand that better? Thanks for the question. First of all, the key of G and Em are the same notes. So this is more a question of how you should think while you play. G augmented has the notes G B D#. B augmented has the notes B D# F##. F## is enharmonic with G. In other words, they’re the same chord. Your friend is implying that you should think in terms of E minor since the V (dominant) to I change, also known as the Baug to Em change resolves as strongly as any. So why would someone write G aug instead? It was probably because the G was lowest note and it was shared with the other G chord. In other words, it was notated to make it easier to play, not to make it easier to understand (or they were playing by ear and found it without knowing the theory behind it). I hope this helps. I’ve been jamming a song that goes F Dm Am G, then F Dm F G… I found some good harmonies by ear but am just wondering what your advice would be for quickly being able to locate the tonic in order to find the foundation of either the major or minor pentatonic scale. … I know depending on the genre of music, there can be different formulas, but I assume 1 4 5 is the most popular with a 2m or 6m thrown in? I really appreciate your help! The key is C, but it looks like they are avoiding C chords. You can use major pentatonic scales over the major chords and minor pentatonic scales over the minor scales. I’d start with F major pentatonic. You may want to try F lydian mode since it’s the key of C without a C chord, yet they use F major a lot. I hope this helps.